The birds' chirping, hummingbirds buzzing overhead and wind in the trees make an outdoor living area into a peaceful space for a busy homeowner. A small, environmentally friendly patio provides a sitting area where you can put a bistro set with an umbrella. The advantages of gravel patios include water permeability, flexibility in design and relatively easy installation. Begin by selecting the site of the patio. It should be relatively level, convenient to an exterior door or near a path if you prefer a private patio near the garden. Mark the area with landscaper's paint or a garden hose. Place the patio furniture on the area and walk around it to ensure that you've allowed enough space for your patio decor. Correct installation of the patio's base ensures that your patio remains level and easy to care for through the years. Using a flat-bottom shovel, excavate the patio area. Remove all grass, debris and dirt to a depth of 4 inches. Smooth the underlying soil with a rake. Ensure that the area is even by placing a piece of scrap wood or two-by-four board onto the soil and setting a spirit level on top. Dampen the soil by sprinkling it with water before using a plate compactor to compact the soil. Double-check with the spirit level to ensure that the area is still level. Add some of the excavated soil to any low spots, dampen with water and compact the area again if necessary. Install a flexible edging of metal, plastic or wood bender board around the perimeter of the patio. Use wood stakes to hold the edging tightly against the cut edge of the patio area by pounding a stake into the ground every 12 inches. While the edging may extend 1/4 to 1/2 inch above the surrounding grass or soil, pound the stakes 1/2 inch below the top of the edging so they are not visible when the patio is complete. Rake 2 1/2 inches of base material over the compacted soil. Base is generally a mixture of 3/4-inch crushed stone and stone dust. Dampen the base and compact it firmly with the plate compactor. Again, check the level of the patio base with the spirit level. Install landscape fabric over the base. Landscape fabric helps prevent weeds and grass from growing up through the patio. It also serves as a divider between the different materials used in the patio. 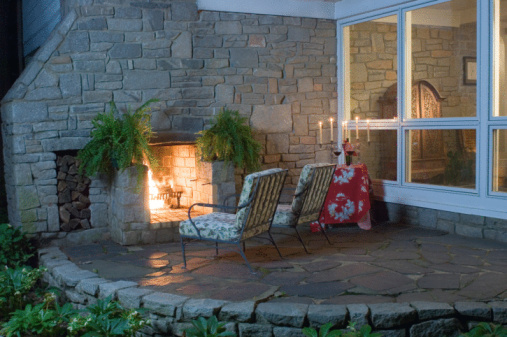 At this point, you can use crushed granite, crushed gravel or pea gravel as the patio surface. Crushed granite or gravel compact together with the rough edges locking into a relatively smooth, hard surface. Pea gravel is rounded, making it a soft surface that may not be suitable for family members with mobility issues. Add the last layer of gravel to the patio, filling it up to the top of the edging. Dampen the gravel with water and compact it tightly. Add more gravel to the top of the edging, dampen it and compact it again to make a solid surface for your patio furniture. Can You Use Pea Gravel Under a Patio?